It’s no secret that I’m a huge fan of pumpkin. These cakes are substantial enough to stand alone for a breakfast. The lemon zest adds a nice zing, and the tea-infused maple syrup is so refreshing. I used Aveda’s tea for this because I love the flavor the peppermint/licorice root/sweet fennel-infused maple syrup has. It’s a little menthol, complex and decidedly sweet. It’s warm and thin and makes a great side dipping sauce (versus pouring it all over the top and consuming more calories then you need to). The combination is unexpected, and surprisingly bright. 1. Whisk together all the dry ingredients in a bowl. In a separate bowl, whisk together the pumpkin purée, soymilk, lemon zest and vanilla extract until combined. Then add the liquid to the dry mixture and stir until combined. Don’t beat it to death. Just work it until smooth. 2. On a griddle about 375-385, add pancakes in about 1/3C at a time using the back side of the cup to spread out evenly. Flip when the batter lets off steam and it starts to bubble around the sides. Flip and brown on the other side. 3. For the syrup, warm the syrup over medium high heat with your tea (bagged or in a tea ball) in a small saucepan until it starts to simmer. Taste for the tea flavor, adjust accordingly. Leave tea in longer for more flavor, add more syrup if too strong. 4. Serve stacks with syrup on the side for dipping. Enjoy! I think this recipe just made my life a little better. Counting the days til Autumn. Thanks! Thank you! 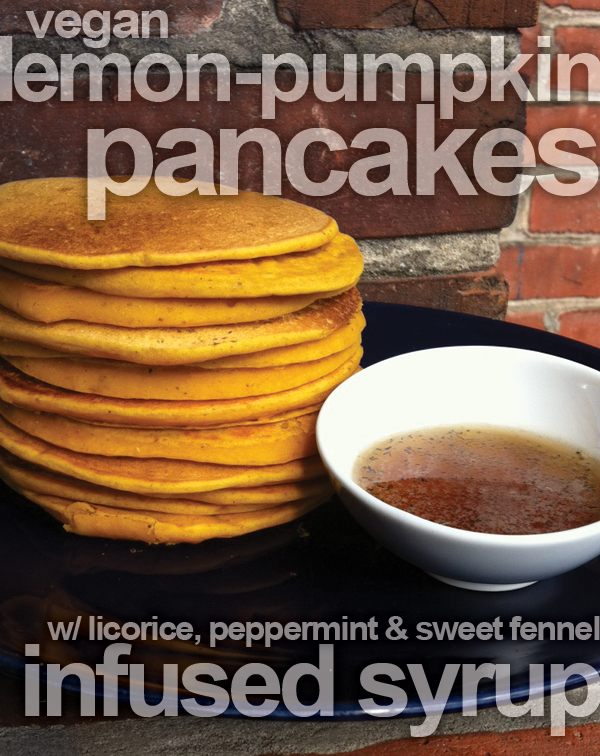 I do crave this year-round, but it really is fun for an autumn brunch! Let me know how it goes for you! !